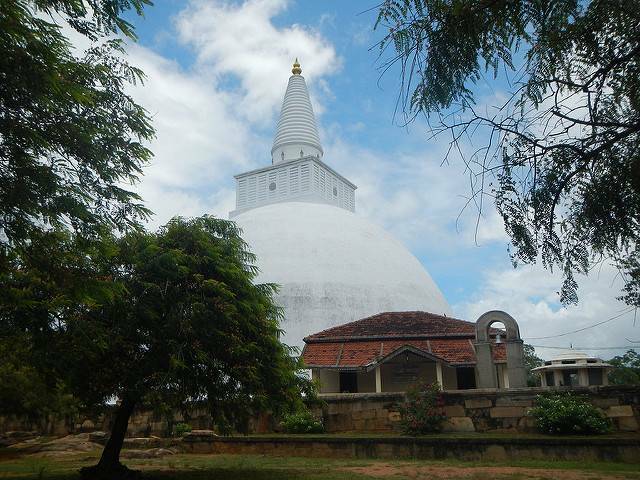 Mirisaveti Stupa, located 1 kilometre to the east of Maha Bodhi, along the banks of Tisawewa, is yet another tourist and religious spot in the ancient capital of the country, Anuradhapura. It was the first dagoba built by King Dutugamunu, a well-known ruler of the country, in 2nd century BC. The story behind the creation of this splendid stupa is that after the king had successfully completed the war with the Cholas, the sceptre that contained the Relic of Buddha was stored by the king in a place before leaving for the water festival at Tisawewa. When he returned, he found the sceptre to be immovable. He then decided to provide a shelter to this relic to safeguard it. This dome, enshrining the sacred relic, rises above the ground to 192 feet. The dagoba was reconstructed many a time and the recent construction was done in the 1990s.